One of the UK’s fastest growing craft bakers has installed its third and most extensive processing installation from specialist equipment manufacturer Oddy – enhancing its production capability and, importantly, providing an excellent basis for continued growth in the future. 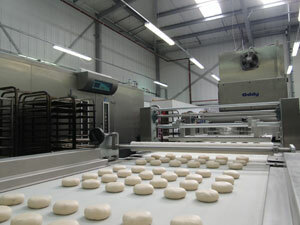 Rugby-based John Dwyer Bakery Ltd., which for more than 20 years has built a successful business supplying customers ranging from schools and colleges to local retail outlets, now utilises an Oddy six-row roll plant. The installation is providing excellent levels of throughput, high product quality and consistency and, of particular note, flexibility of production. 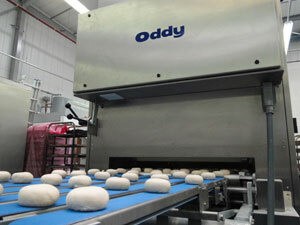 The Oddy processing line is preceded by four dough mixers from which the roll divider is loaded manually. The dough divider weighs and rounds dough pieces, forming them into a choice of products ranging in weight from 10 – 210 grams, before discharging them in rows of six onto a conveyer ahead of the proving facility. The output speed of the divider can be adjusted to meet production throughput requirements and has been designed by Oddy to need minimal maintenance, due to build characteristics such as sealed bearings and long life, non-stick coatings. He explains that the multi-function, modular table forms products into, for example, finger rolls, sub-rolls or bread cakes before they are automatically delivered onto the roll panner. From here, they are collated into batches, depending on packaging requirements, before they are transferred automatically into trays to be moved to cool room retarders for a period before final oven baking. “This is our third Oddy installation at the site to date and is not only the largest but also the most flexible,” adds John Dwyer. “We believe it reflects our ongoing focus on investment in high quality, manufacturing systems and our commitment to developing our business. The facility complements our plans to increase our output in the forthcoming period and to extend our current 50 mile radius market area,” he explains. “We are delighted to have been able to install a further, larger unit for John Dwyer Bakery and believe the facility is an excellent demonstration of our equipment design and its suitability for the craft baking sector,” comments John Glover, Oddy Sales Manager. “The two key requirements of the specification at the Rugby site were to provide the option to increase throughput capacity, and also to provide flexibility to match product types – the proving centre with the optional bypass capability is an excellent example of this latter objective being fully met. Furthermore, by providing a complete facility – from initial forming to completion – the installation provides a comprehensive link between the mixing stations and the cool room retarders,” he adds. “We are confident that the facility, which is now fully operational in Rugby, will meet not only John Dwyer Bakery’s immediate requirements, but also its development objectives long into the future,” John Glover concludes.